For the first time in the internet era of the NCAA Tournament, one bracket is still perfect after the first weekend. Submitted on the NCAA.com’s Bracket Challenge, the “Center Road” bracket correctly picked the first 48 games of the NCAA Tournament. It shattered the previous record of 37 set in 2017. According to the NCAA, if every game were a coin toss, the odds of predicting 48 in a row are 1 in 281,474,976,710,656. To keep the streak alive, the chalky trend must continue into the Sweet 16. If the “Center Road” bracket predicts the future, Kentucky fans should be pleased in April. Wow, excellent job whoever this belongs to. Mine is close to perfect, I got some work to do next year. Go cats, and go to whoever this bracket belongs to!! I would’ve thought it was yours my dude! Mine is in the top 50 of the KSR bracket challenge, and one of my 25 (yes, 25) on espn is at 92.5%, good enough to be in the top 1.3 million! Thank you sir for believing in my bracket. At last check my bracket was top 3 in the ksr bracket challenge. 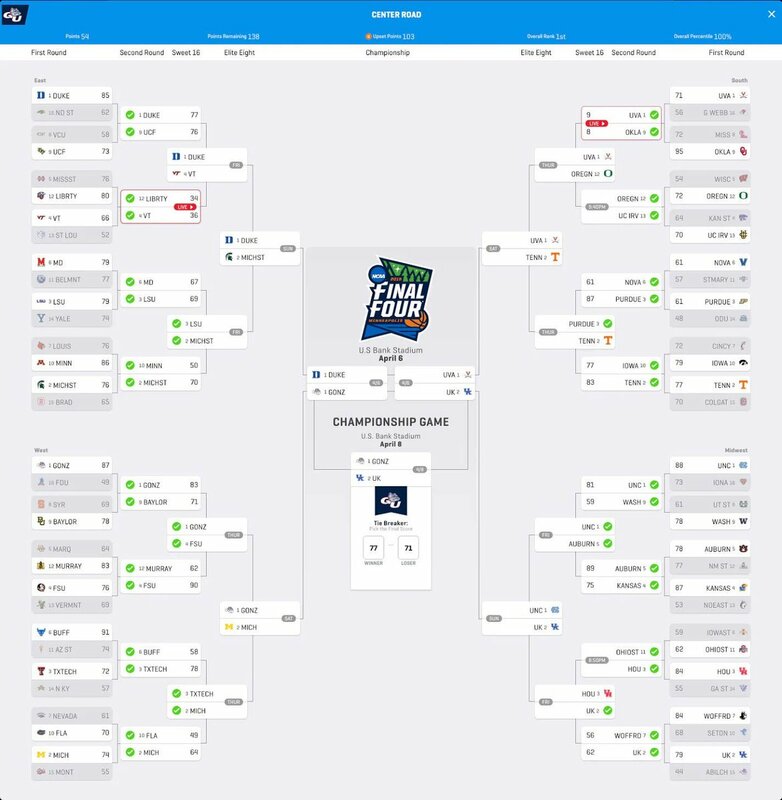 You know back before the internet in my bracket filling out prime I had 3 perfect brackets. They were my wife’s office bracket challenge. It was 92,94,and 96. The first year she won a fruit basket, the second year she won a nail salon 15 dollar gift card, and the last year she won another fruit basket and 20 dollars cash. Those were the days. Go cats, and go nocodes bracket!! I’m calling BS of the three perfect brackets. No way. No thanks catsarerunnin I’ll take a fruit basket though. Go cats, and boo catsarerunnins bracket!! My bracket was messed up after the first game ended…thanks a lot Louisville! Same. Another reason to hate Louisville. Why would Kentucky fans be pleased with a loss in the championship game to Gonzaga? I thought the same thing. I literally couldn’t care less if we make it that far to lose to Gonzaga in the Finals. Like, if you told all of BBN right now, “you lose to Gonzaga in the Finals” we collectively would not be happy at all. I will not be pleased if we lose to Gonzaga in title game! Hell no! Meh. It’s a chalk tourney so far. There are going to be a much higher number of accurate brackets this late. I believe all but two teams in the Sweet Sixteen are the highest seed possible. In the interest of full disclosure the person known as “Center Road” should reveal how many brackets they filled out. The over/under is 107.